I LOVE this – the print is fabulous for a shift dress! 🙂 I’ve been waiting to see the full dress after seeing all your in-progress tease shots on Instagram. 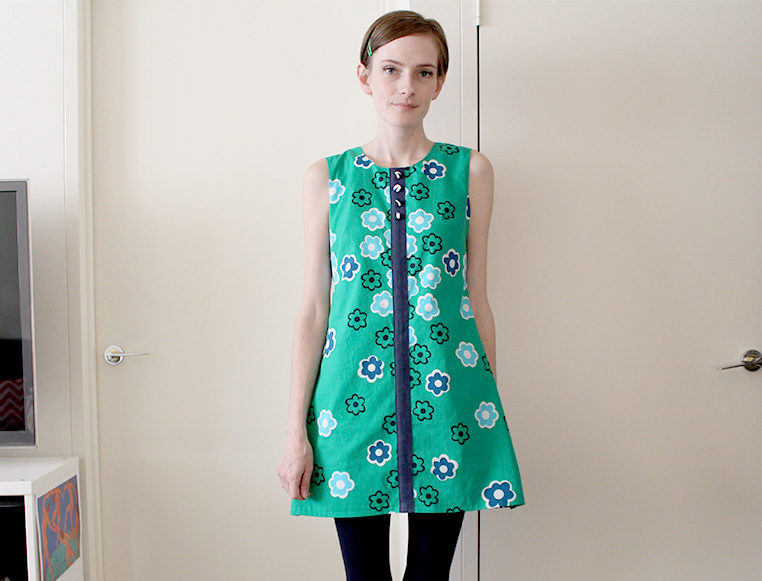 Is the Burda pattern your go-to for shift dresses? I think I need shift dresses in my life but I’m not sure which pattern to pick! Thank you! ☺ 🙂 I would say it is for the moment! 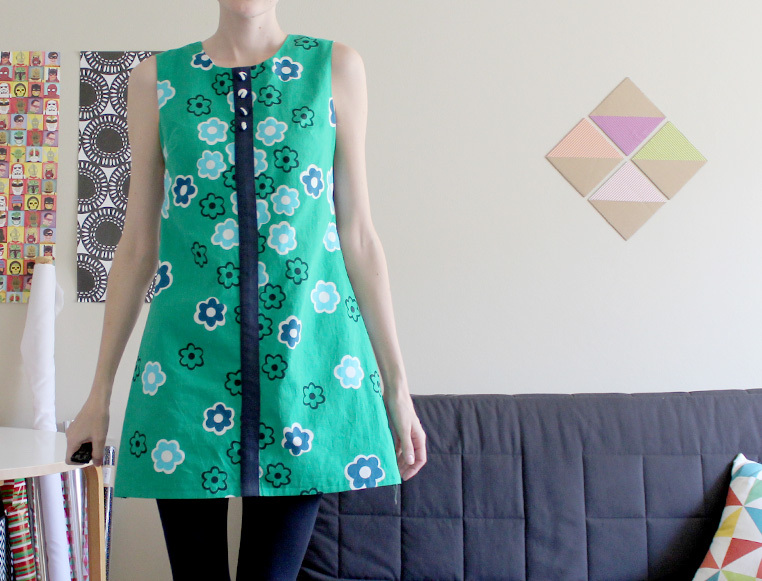 I still want to try more shift dress patterns but this is the one I have had most success with so far. It’s hard to choose! For a loose style this burda one is fun and for a more fitted shift I would probably recommend simplicity 1609! Great, thanks! I’m really stocking up the next time the Simplicity site has a sale – I’ve about 7 patterns on a wishlist already! Thanks so much mum! I also still have more fabric left over 🙂 ! Thanks again for the lovely fabric! I think it’s great, totally NOT clown-like! Aww thank you! glad you don’t think its too clown-like! No, not clown-like at all. Just absolutely fabulous! I LOVE this dress. I think it suits you beautifully, the colours, the style, and the navy stripe. I want one now! Gosh thanks so much! So happy you like it!! I love it! In a world where everyone dress the same, it is nice to stand out so beautifully! I love a fun dress and this one is amazing! Perfect for summer. I don’t see “clown” at all, but if you want to dress it up a bit just add a navy cardigan. Did I mention that I love this dress?! No clown-like in the least. If you ever feel that way when wearing something, through on a pair of heels or high boots with it. This dress just screams your style, absolutely perfect! It’s a pretty retro dress! If you wear it with a navy blazer, it will look more grown up and on days when you want to have fun, you can wear them with mary janes and knee socks! When I like something, I like them even better in multiples. Like the same pair of shoes in different colours. Sewing allows us to make the same dress in different fabrics and with little tweaks to make them more fun! Enjoy your new dress! Thanks! That’s true, I know just what you mean, when I find a pattern I like, I want to make one in every colour too 🙂 That is one of the brilliant things about sewing 😀 Thanks for the reminder! This is super cute on you! It’s totally working! And hemming the dress and the lining before attaching them is so smart! Great idea! You can totally pull this off! Me on the other hand, I’d look like an old lady who refuses to grow up. (ha!! I guess I really am anyway) :)> I love it and think you should totally rock it! Thanks so much! 🙂 I doubt that, but I feel like that too! Growing up is so overrated, isn’t it?! That sounds great, I’m absolutely flattered and delighted to have inspired you! I love the things you make! Cool! Look forward to seeing it! this is awesome and you should totally wear it like all summer long! great job with the positioning of the patterns and good idea with the navy strip. i probably would have done the same or maybe some kind of ruffle maybe? cute dress lady! Thanks so much Catherine! it means so much! 🙂 Ooo a ruffle! why didn’t I think of that?! I might be the wrong person to ask but I think every grown up needs a few frivolous dresses in their wardrobe or life gets too boring. You are right! Life’s too short for wearing jeans all the time!